The Autograph Bounty Hunter is an online service for autograph collectors worldwide. Since 2002, we offer the possibility to order authentic autographs of international superstars, cast- and crewmembers of blockbusters and television series. We specialize in Star Wars autographs and current television series autographs. Our strenght is the fact that you can get your items personalized and that you can even send in your own items to get signed, such as photos, cards, posters and toys. 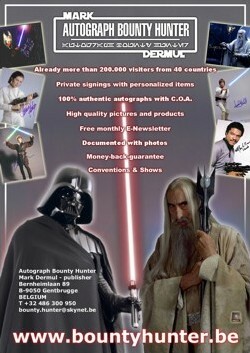 In the past years, the Autograph Bounty Hunter has organized over 200 signings, including private signings with stars such as Mark Hamill (Luke Skywalker in Star Wars) and Sir Christopher Lee (Saruman in Lord of the Rings). We also regularly visit autograph shows worldwide, using a network of trustworthy Bounty Helpers, who provide you with photos and videos of their work, proving the authenticity of your items.